A few people had important jobs to do, and jeeps and trucks navigated through and around muddy holes in the narrow unimproved roads. I tried to stay out of their way, not having a particularly important job, nor any particular preference for being splashed with mud. Along the way I passed a low lying field which had been given over to a vehicle scrap yard. Rolling machines of every variety had been driven or dragged there when it was still dry. They covered several acres, with barely room to walk between the rows. Today young privates in ponchos waded through ankle deep mud with hand tools, including a portable blowtorch, hunting the new relics for usable spare parts. My own feet were soaked, after I used up my own luck avoiding deep puddles and clenching mud along the road west. I had managed to obtain a good poncho and one pair of dry socks back in camp, but the socks were soaked again already, along with my uniform and courier bag, my only luggage for now. After a couple hours of miserable slog, I was made to feel better in comparison to the more miserable men I was there to find. Soldiers of the 1st Cavalry Division had found no rest in camp, no change of socks, and rarely even a flat patch of land to lie down on for the last ten days. I checked in with one battalion CO and got up to the front to see his soldiers. 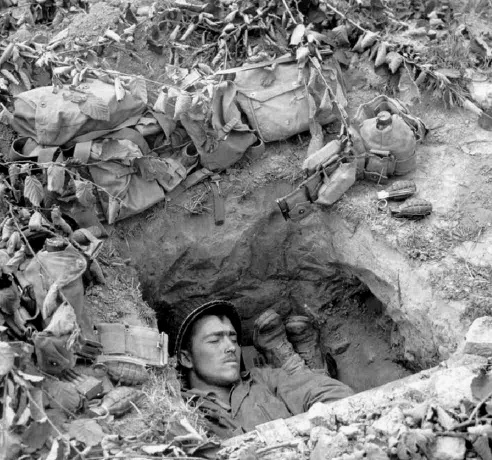 From mortar men in back, machine gunners up from them, and riflemen in fresh dug (and poorly draining) holes on the line, they had stories similar to what I got out of the 43rd Division. The 1st Cavalry Division had been fighting up into steep hills, in repeating lines, for over a week. Then they had to give up much of what they had won. The Japanese rush had caught parts of the division from behind. Its other regiments had to turn around 180 degrees, come down out of the mountains, and fight on the beach again. From there I walked just across an imaginary line to the domain of the 185th Regiment, of the 40th Infantry Division. The 1st Cav will move back into the hills now that the 40th is here. The 40th just got here and saw action right away moving in to cover the side and rear of the 1st Cav. I spoke with some of the soldiers about the large attack by civilians. There wasn’t much chatter at first, but after the first few fellows started I couldn’t get the stories down fast enough. Probing into the outskirts of Kanoya, keeping close to ready cover should heavy artillery start again, lead units found the trip lever of a trap. Regular Japanese army soldiers opened fire from cover to the north. It wasn’t very effective, but it made most of the regiment stop moving and find cover while they could set up a response. Fire from the north stopped and immediately American rifles on the left were engaging with a mob running in from the west. Comments on the action ran from wild to tragic. In the end, the American line held, but they say about two hundred more of our men are gone, half of them for good. The burial detail has made room for five hundred Japanese, and they think that may just about do it. Facilities are being assembled to lock up the survivors, pending interrogation to sort out any regular military left among them.